Could 2013 bring with it one of the biggest revolutions in mobile phone design since the advent of the touchscreen? If the growing rumors surrounding flexible displays are true, and that one of the major manufacturers will release a device with a bendable screen next year, then yes, we could see the start of a huge trend. While flexible smartphone screens will be new to most of us, the technology has been around for some time, and is already in several devices; you just may not realize it. Reports of companies developing flexible displays date back more than a decade, with a startup named Universal Display being linked with their development in 2002. Universal Display is now at the forefront of research into OLED screen technology and the creator of the panels used in Samsung’s Galaxy S2 and S3 smartphones. At the time, Universal Display’s CFO described flexible displays as, “sci-fi stuff;” however, despite ties with Samsung, it was Philips and Sony who both demonstrated the potential of flexible screens a few years later. Philips effort was a monochrome, rollable E-Ink screen on a device named the Readius, which was shown off at CES 2006. A year or so later, Sony demonstrated a 2.5-inch flexible color screen, which it claimed was the first of its type in the world. Since then, different interpretations of these basic ideas have appeared on some interesting, low volume products. Most notably Seiko’s Spectrum SVRD001 watch, which used a flexible E-Ink screen, and a moderately flexible E-Ink section took pride and place on Esquire magazine’s October 2008 cover. Non-rigid E-Ink displays have gone on to be featured on many e-readers, including the Amazon Kindle, but because the rest of the components aren’t flexible, you’d never know. An offshoot of this technology is LG’s Electronic Paper Displays or EPD, as shown recently on the Wexler Flex ONE e-reader. LG’s EPD screens are higher resolution than most standard E-Ink displays, plus they’re lighter, thinner and more bendy too. As versatile as E-Ink and EPD screens are, they’re not really suitable for use on smartphones. There are many reasons for this. Most obvious is that the response times are too slow, meaning they can’t display video, and they don’t handle color very well. Cost is a prohibitive factor too. For flexible screens on our phones, we need to return to Universal Display’s OLED technology. Flexible OLED displays are light, thin, very flexible, and crucially, don’t need to be covered in glass, so they can be flexed and twisted to your heart’s content. They also perform in a very similar way to existing AMOLED screens. Because there’s no glass layer, there is nothing to break, making them considerably more durable that today’s glass-covered screens. Exactly how tough are flexible OLED screens? Tough enough to be abused with a hammer and still operate as normal. However, just because the OLED screens don’t need to be covered in glass, doesn’t mean we’ll want them that way. Not only is plastic easily scratched and scuffed, but it’s not as pleasant to slide your finger across as glass. This is where Corning, makers of Gorilla Glass, comes in with its new Willow Glass. This incredibly thin, strong and flexible glass sheet has been expressly designed for use with non-rigid OLED displays, solving the inherent problems of a plastic touchscreen. So, let’s take a moment to think about how flexible OLED displays with Corning glass will be marketed to both manufacturers and to the consumer. Manufacturers will like them because they provide the opportunity to come up with new and interesting designs, plus their thinness means devices can be skinnier, and it’s expected the production costs will be low. For you and me, a device with a display that could realistically be called unbreakable is a huge benefit. Overall, just think of flexible OLED screens as thinner, lighter, and more durable than their rigid counterparts. As different form factors are explored, other opportunities to exploit bendable screens will arise. Nokia created a prototype device with a flexible display and a kinetic user interface, where twisting and bending the phone resulted in actions similar to gesture controls on a touchscreen. Nokia has had a long history of experimenting with flexible smartphone screens, just take a look at its stunning Morph prototype from several years ago. Expect curvy, but fixed position, flexible screens soon. However, before you start imagining 2013 as a crazy year of flippity floppety, bendy smartphone designs, we must rain on your parade. The problem is going to be all of the other very stiff hardware needed to make a phone. There has been some research into making flexible memory sticks and batteries, but none of these technologies are close to being mainstream, so phones incorporating flexible screens will be fixed in position for a start. While this isn’t quite the sci-fi dream, it still provides plenty of opportunity for manufacturers to have fun with the design of their phones. Smartphone design has stagnated over the past few years, but twisty screens could mean a resurgence in creativity when it comes to how they’re used. No longer will the rectangular screen be standard, as screens could curve all the way round the chassis – creating a true edge-to-edge display – as well as providing yet more opportunity for different control methods. Ergonomically shaped phones which incorporate the screen as well as the chassis could become more common. As the technology continues to advance and we start to get flexible innards too, then we’ll get the super-thin displays that can be rolled up – harking back to Philips Readius – or collapsed down to a more manageable size, much like Nokia’s Morph. 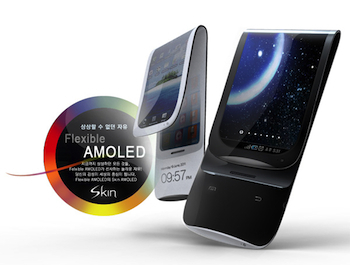 Samsung is probably going to be the first manufacturer to release a phone with a flexible display in 2013, something it has been rumored to do by several sources over the past year. 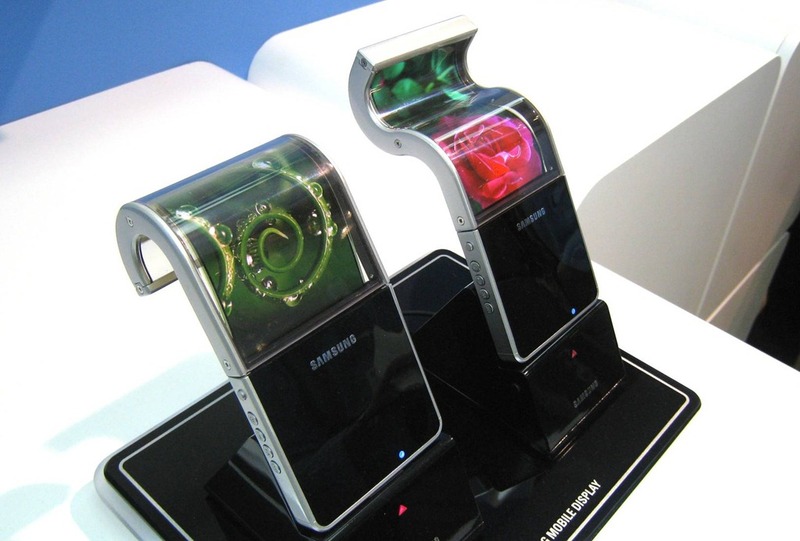 In 2011, a concept phone with the name Samsung Galaxy Skin appeared, which used a flexible display bent around a 1-inch cylinder for storage, giving us a basic idea of what a flexible screen phone could look like. An analyst for UBS has since speculated the next two generations of Galaxy S models, “will have unbreakable and even possibly flexible and foldable displays by 2014.” Samsung’s close association with Universal Display will certainly pay off, should this be the case. Other rumors aren’t so positive and have indicated Samsung has had problems manufacturing the screens, causing the launch to be delayed until later in 2013. There’s a chance we’ll know more during CES 2013, where Samsung has teased that something innovative and exciting will arrive. Any new branding – the bizarre YOUM name has been linked with its flexy tech in the past – could be introduced alongside a new brand identity. Arch-rival LG is also pushing forward with flexible OLED technology and has plans to put such screens into production after summer next year. Other companies such as Sony have shown an interest in flexible screens in the past, but haven’t invested in it as highly as Samsung and LG. So why, aside from the benefits we’ve already discussed, are Samsung and LG so interested in flexible screens? According to UBI Research, next year 20 million flexible AMOLED panels are expected to ship, which will increase to 120 million by 2015, and revenue from them will rise to $1.2 billion. That’s quite an incentive to be among the first on the scene. While revenue is great for manufacturers, for us as consumers it will be the almost inevitable wave of innovative new smartphone designs, which the flexible display panel could prompt, that truly excite.